I had an opportunity to speak with Tony some time around the middle of January, following the worldwide dissemination of the news that he was in a hunger strike. 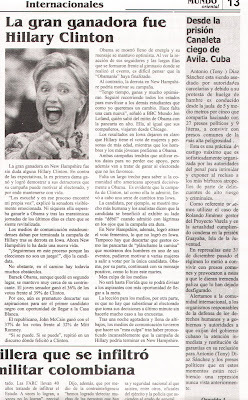 Julio Hernandez, Miami-based representative of the Movimiento Cristiano Liberacion, forwarded me this clipping from a Venezuelan newspaper with a story about Tony and his strike. At a meeting in Spain, Jorge Moragas Sanchez, Popular Party parliamentarian from Barcelona, also makes brief mention of this news item. I include the entire YouTube clip because Moragas and his colleague Carles Llorens provide a fairly concise and comprehensive overview of the deplorable state of human rights in Cuba. From what I was able to gather, Tony is not refusing food. However, in protest against his treatment by the authorities, Tony is beginning to refuse his medications. Because of the limited time available to speak over the phone, and Tony's tendency to speak in machine-gun fashion, I wasn't able to catch the name of the specific medication he is refusing. Tony seemed quite intent on expressing his demands, so I jotted them down to the best of my abilities and transcribe them here for those of my readers that have an interest in helping out with Tony's situation. Tony appeals to Cuba's judicial authorities for the enforcement (and respect of) the laws and regulations pertaining to his confinement. These are the very same laws the courts are entrusted to preserve. Tony warns the Cuban Government of the consequences of any further postponement of his transfer to a proper medical facility for treatment of those ailments diagnosed to date. Any other course of action threatens his state of health. I am not very confident that Tony's medicine strike will have its desired effect. The Cuban Government has always been prone to enforce its laws arbitrarily. Refusal to take medicines is only going to damage Tony's health. The only type of pressure that has ever influenced the Cuban Government has come from abroad, and usually from its friends. I am rooting for a changing of the guard in Spain on March 9th. I am anticipating those electoral results more than any other. Should the Popular Party fail to gain a victory, I appeal to the Socialists to reverse course with Cuba and demand the immediate release (or at least the humane treatment) of all political prisoners and dissidents still on the island. I leave you with Moragas and Llorens on the topic of discrimination against homosexuals in Cuba.